Eco-conscious homeowners have been switching to energy-efficient dishwashers, light bulbs, and washers and dryers to save water and money. It’s now time to consider sprinkler irrigation upgrades. New sprinkler technology has made it easy to save water, and many cities including Seattle offer rebates or other incentives for those who upgrade to energy-saving water devices. Rotary nozzle from Rain Bird. Consider replacing old sprinkler heads, especially those 10 years or older. New sprinkler heads are much more efficient at delivering water where it’s needed. These heads have built-in pressure regulators to minimize water loss through misting or fogging from excess pressure. Heads can also be fitted with check valves to eliminate low-head drainage. The city of Seattle and other utilities participating in the Saving Water Conservation offers a $10 rebate per sprinkler head with pressure regulation and/or check valves on heads with drainage problems. Convert to high-efficiency rotating nozzles.These multi-stream nozzles save up to 20 percent less water than traditional spray nozzles. They distribute water more slowly and uniformly. The water is less likely to mist and reduces runoff into sidewalks and streets. The city of Seattle and other utilities participating in the Saving Water Conservation offers a $3 rebate per nozzle. Drip system conversions. Convert certain areas of your landscapes, such as a plant beds and vegetable gardens to a drip irrigation system. These system slowly drip water directly into the soil, preventing evaporation and diseases that could result from allowing too much moisture to get on foliage and fruit. The city of Seattle and other utilities participating in the Saving Water Conservation offers a $0.30 rebate per square foot of landscape bed irrigation with drip. 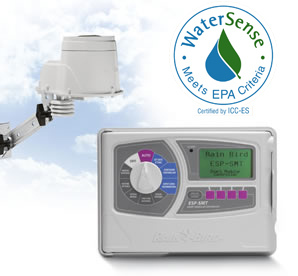 Rain Bird Smart Irrigation Controller. Install a smart irrigation controller. These weather-based smart controllers allow you to set how often and how much you water certain areas of your lawn or landscape. Smart irrigation technology senses weather changes and adjusts the irrigation accordingly. If it rains, it stops watering. If it’s hotter or the soil is drier than usual, the controller will increase watering. The controllers do all the work, and they are a much more efficient and sophisticated way to reduce outdoor water use. Studies show that weather-based irrigation technology help reduce outdoor water use anywhere from 15 to 30 percent, depending on the type of controller and where it was used. Tune up and maintain your existing sprinkler system every year. Cap sprinkler heads that you no longer need (i.e. in an area where a patio was installed). Regularly check your system to make sure none of the sprinkler heads are broken or leaking. Fix areas where you have sprinkler overspray; where water is getting to areas that don’t need to be watered like your sidewalk! Contact us at (206)-770-7879 or email us for a consultation if you are interested in upgrading your sprinkler system.